On 8 March 1921 newspapers reported that the first 34 women had been appointed to train as dental nurses for the state-funded School Dental Service (SDS). A world first, the SDS was established to provide New Zealand primary school children with free dental care, in recognition of the appalling condition of New Zealand children’s teeth; it had been found that four out of five schoolchildren were in need of dental intervention. The social policy of the time was also heavily focused on children’s health and wellbeing. One hundred and twenty applications were received from women wishing to enter the SDS. 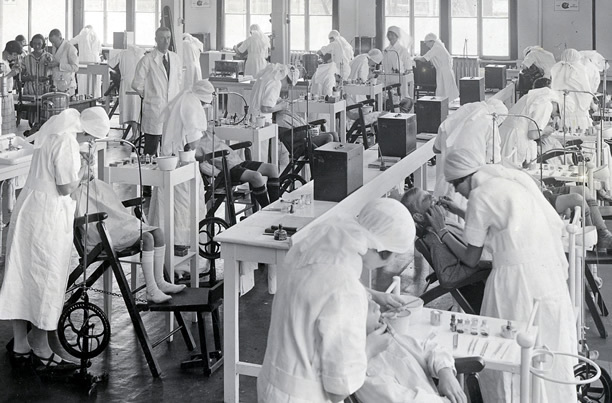 In April 1921, a temporary training facility opened in Wellington next to Government Buildings and training of the first school dental nurses commenced. Much of the equipment in the temporary facility was used by the Dental Corps during the First World War, and had been retained by the New Zealand Defence Department. The nurses undertook an intensive programme of study, which included learning chemistry and anatomy, dental treatments and extractions. The first school dental nurses graduated in mid-1923. The upskilling of women to provide dental care in schools was not supported by everyone. Numerous meetings were held around the country and submissions were made to the government opposing the training of women to perform dentist’s work. Opponents viewed the training of dental nurses as less cost- and time-effective than employing already-trained male dentists, and some feared it would lower professional dentistry standards. We have 22 biographies, 5 articles, related to First appointment of trainee school dental nurses.